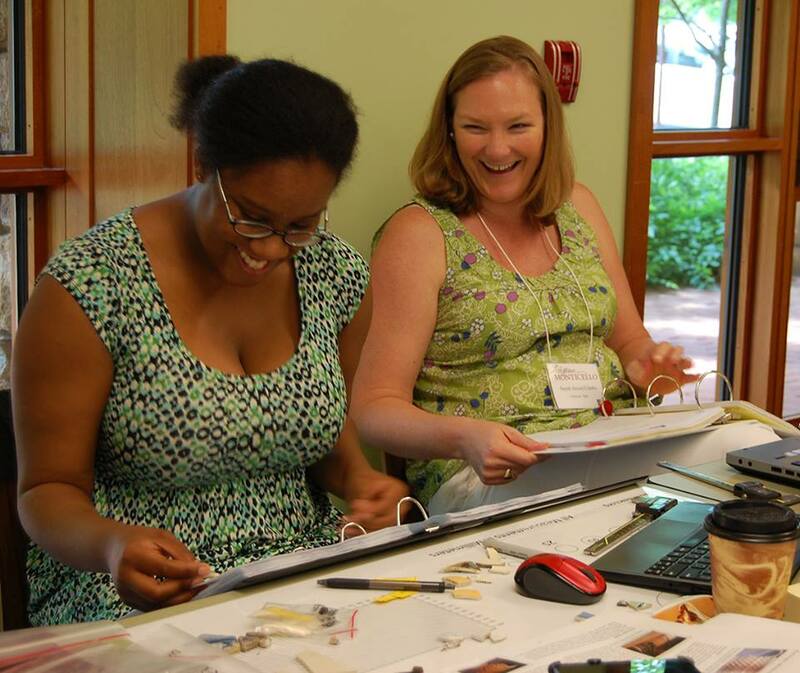 Camille Chambers of the College of William and Mary and Drayton Hall archaeologist Sarah Stroud Clarke enjoying their DRC training session in May at Thomas Jefferson’s Monticello. In 2012 Drayton Hall became an institutional partner of the Digital Archaeological Archive of Comparative Slavery (DAACS), an extensive archaeological database created in 2000 by the Monticello Archaeology Department to foster scholarly collaboration and data sharing of archaeological resources. Sarah Stroud Clarke was in residence at Monticello for five weeks in 2012 as an International Center for Jefferson Studies/DAACS fellow to train on the database before its installation at Drayton Hall later that year. 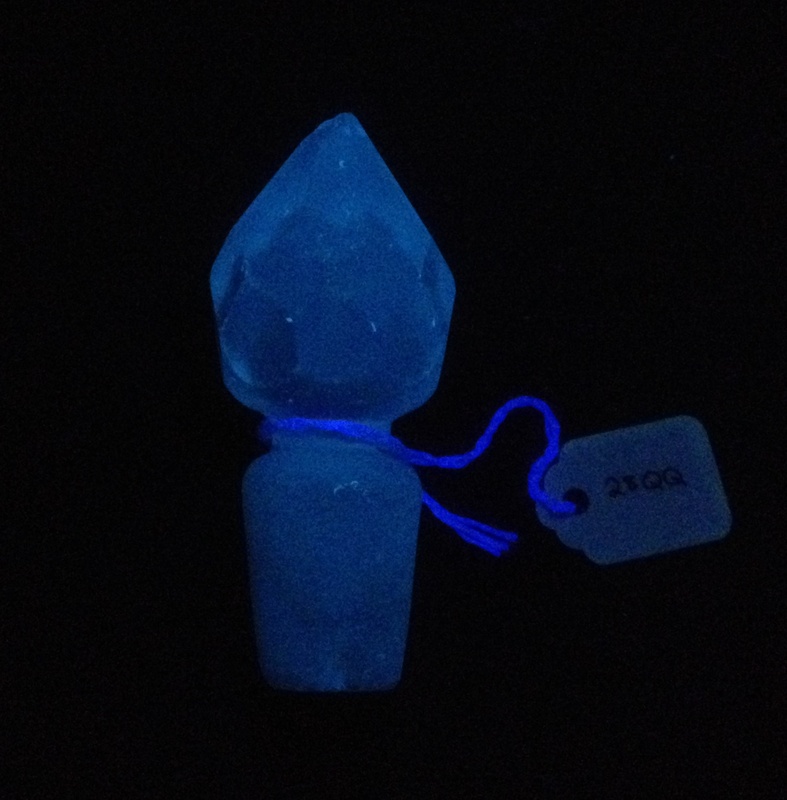 A glowing lead-crystal bottle stopper from the Drayton Hall Collection. This UV lightbox is used to determine if glass is leaded. In April of 2014, DAACS received a $450,000 grant from the Andrew W. Mellon foundation to support the DAACS Research Consortium or DRC as a web-based initiative. Eleven partner institutions were chosen to take part in the DRC including Drayton Hall, Monticello, Mount Vernon, the South Carolina Institute for Archaeology, the Jamaica National Heritage Trust, and six universities. As part of the DRC, each partner institution was charged with choosing a case study to catalog using the DAACS protocols in the new web-based format. Drayton Hall has chosen the South Flanker well, a wood-lined well that was partially excavated during 1979/1980. Sarah is currently spending much of her time working to catalog the estimated 60,000 artifacts excavated from this context. It is hypothesized that the well was filled in during a post-Revolutionary War clean-up of the property. When the detailed analysis of the artifacts from this feature is complete we will hopefully know much more about the residents of Drayton Hall in the eighteenth century. The DRC grant also funds a series of trips to Monticello for DRC meetings and training sessions for Sarah and Dr. Carter C. Hudgins, as well as new equipment for the Drayton Hall archaeology lab. 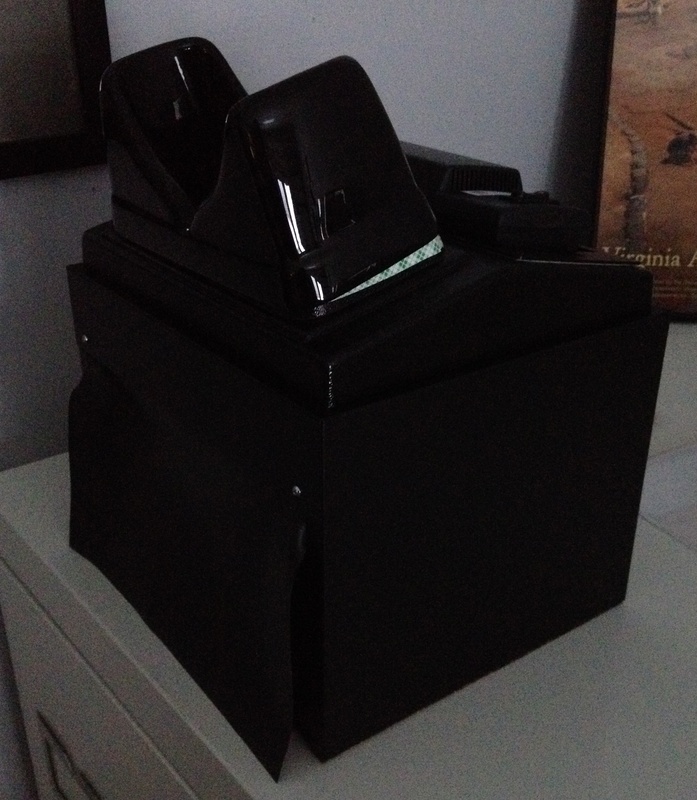 One recent purchase is a short-wave UV light used to determine if glass is leaded. Artifacts glow an ice-blue color if there is lead present in the glass as is demonstrated by this lead-glass bottle stopper that was found in the South Flanker well (pictured above). The project is set to be completed by the end of March 2015.